Operating as a non-profit offers the opportunity to apply for a variety of grants from various sources, one being the company American Electric Power and their Access to Environmental Education Fund. Camp was successfully awarded this grant a few short months ago, and has since been able to implement a traveling insect class. This off-site environmental education has been utilized in learning spaces across Hocking and neighboring Appalachian counties and targets kids of all ages. Our most recent Appalachian Explorers adventure last Friday had brought me, the new AmeriCorps member introduced to the web of camp in September, to the Bishop Education Gardens as four classes of third graders came from Chieftain Elementary. The day-long field trip was filled with a rotation of classes for the kids ranging from amphibians to forestry, and of course, to insects. As I got to use my slot to teach the kids about these creatures, and alternatively go on a quest to find them in our surrounding environment, the kids and myself were humming with excitement. Every student that had done a research project covering an arthropod, or had a factoid about a spider, got to flash their knowledge as we looked through our hand lenses onto the hard exoskeletons of the insect collection I brought for observation. This being the year of emergence for the periodical seventeen-year cicada, it didn’t take long before we had the added bonus of getting a look at our temporary neighbors for the summer, as well as learn about their short romp above ground. The warm spring day was ideal for searching for insects and other arthropods, and gave way to a multitude of web worm larva, hoppers, ants, and spiders. I was delighted as the kids dived in, deliberately searching for anything with six or eight legs, wings, or were an instar away from them. They showed off their catches with pride, and soon we had a diverse collection crawling in our trap jars, before releasing them back onto their respective patch of leaves. 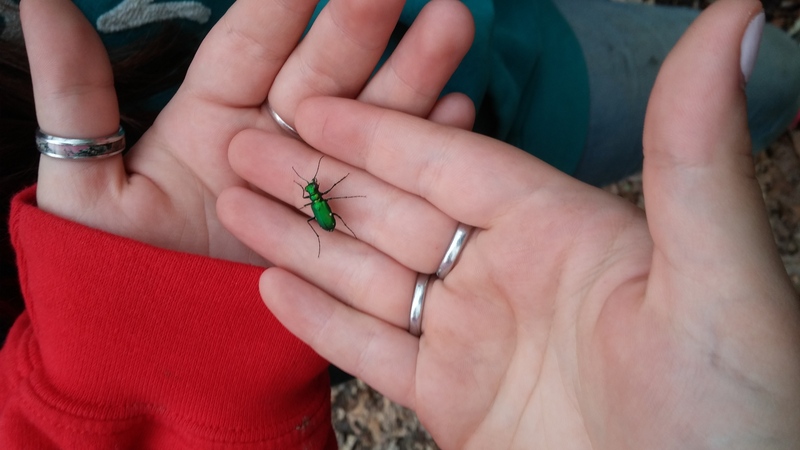 With another Appalachian Insect Explorers program in the books, so we have another group of kids awakened to the marvelous world of insects.